8 years ago today there was a cold drizzle falling. Then it snowed 11.5” that night. Must have been a N/S deal. I don't recall that event at all. The snow that night was fairly localized as a weak outflow met a very moist southerly flow. But didn’t you guys get something in Nov 2010. I thought the second round was focused south of here. It got cold in NW Oregon in November 2010, but there was not much snow. Most valley locations had a T-1" of snow with the arctic front overnight the 22nd. The two coldest days in NW Oregon were the 23rd and 24th. Sub-freezing highs made it down to about Corvallis. Very impressive event for November in NW Oregon. Mid month was incredibly active in 1996. Record snowfall in the Fraser Valley. The 19” on the 16th at Agassiz is their one day record. It pussed out by the time it got to Eugene, but that was the coldest airmass this decade in W. Washington. Colder than anything in DJF. 850's were down to -18c over the WA coast. Really impressive up there. This post would have been 15 times funnier 15 years ago. November 19, 2003 was a nice event. But it was no 1/10/17. #3 November Arctic event in the airport era for sure, after 1955 and 1985. Had that pattern/air mass occurred about a month later, probably would have seen highs in the 17-23 range for western WA, similar to Dec 1990. November 1993 was better than 2010 once you get south of Portland. No sub-freezing highs, but colder lows and longer duration. Similar T-1" snowfall totals. As an overall event for the PNW, though, 2010 easily tops 1993. The coldest places were colder in 2010, and there was a lot more lowland snowfall. I do remember being on the OR coast for family Thanksgiving in 1993 and seeing frozen puddles on the beach, the only time I've seen that in many trips to the OR coast. I won't argue that. There must have also been quite a bit of a radiational cooling component to 1993, The temps down the valley were much more impressive than at PDX. Eugene had 3 consecutive lows in the mid-teens. Kind of the opposite of 2010. Nov 2010 in my area had way more snow. Even with our station missing up to about 4 or 5 snow days it recorded 12.50" in 2010, and our average is 4" for this month. If no data was missing I'd guess 17-18 inches. Nov 1993 did see cold here, but 2010 wins a lot more points for Nov snow that is almost impossible nowadays. I doubt the advection of cold air would have been any different had the Nov. 2010 cold wave occurred in December. The airmass/pattern was what it was. The sun angles and availability of cold air to our north don't differ too vastly from typical mid-winter conditions once you get to November 22nd. The latter point is true for the modern era anyway. It's probably not a coincidence that the advection of cold air at the 850mb level hasn't been exceeded during any part of winter since, in western WA. November 2010 and 2006 had a sharp N/S gradient. Did not. So is the N/S November thing more recent? I guess it's hard to say until we actually get that type of pattern in mid winter. I would argue there is colder air available to the north a month later usually, and all else being equal, the exact same pattern on Dec 22 should easily produce colder temps than that pattern on Nov 22. I agree that it's not surprising that the Nov 2010 event produced the coldest 850mb advection we've seen in the past decade, given that there has been such a lack of mid winter cold advection. FWIW, the coldest high latitude temperatures (at the 850mb level & surface, averaged above 60N) occur in early February, and the oceans (avged above 30N) bottom out in the middle of February. Sea ice peaks in early March. Insolation in late November is analogous to late January. And the ocean temperatures in late November are analogous to those in early April. So I don’t think there is even a comparison to be made between November and January (in terms of cold potential). The amount of available cold in January is just so much greater compared to November (and even December). However, there is something to be said about the “delivery mechanism” for said cold peaking earlier, especially for the West. To put it very simply, the meridional temperature gradient actually tightens through the winter, and as this occurs, zonal winds strengthen and wavelengths increase, which makes it increasingly difficult for deep continental troughs to establish over the West compared to November and December given the climatological wave guide, henceforth more deep cold is sent east of the Rockies. 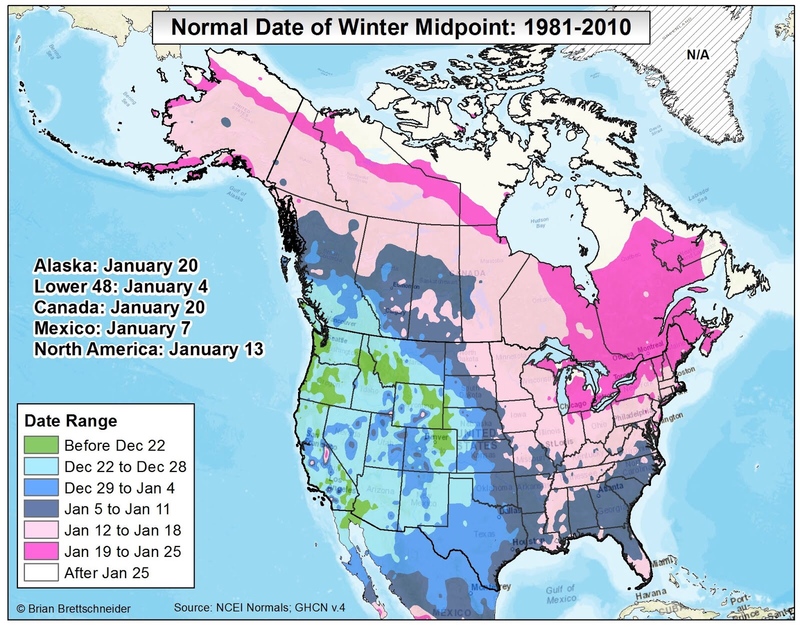 This is why winter temperatures across NE North America bottom out a month later than those in the West. The wavelengths, and the waveguide itself, becomes more unfavorable for deep western troughs as the winter progresses. Those are accurate points, but they aren't driving factors here in the PNW. You're taking a wide top down view that isn't appropriate for our local scale. We've set all-time record lows in November before (i.e. 1896 and 1985), and plenty more in the first two weeks of December historically. All we need is a sufficiently cold dome in northern BC/Yukon/southwestern NT to make its way down without too much modification. That will produce a major Arctic blast whether it occurs in the next ~3 weeks, or in January. Unlike eastern N. America, we're not waiting for large water bodies to freeze; our typical coldest source airmasses don't depend on the high Arctic; and Pacific ocean temps don't vary too much. 1985 was generally a lot snowier and colder for WA than OR. And a big latitude gradient has always been common in November. With events like 1921, 1937, and 1946 the Puget Sound region had heavy snow while OR generally had rain. And the arctic blasts of November 1900 and November 1911 were substantially colder the further up I-5 you went. I made a follow-up post to clarify this. I think we’re on the same page, though (IMO) it’s the nature of the wavetrain/waveguide itself that determines the “mobility” of these cold airmass, rather than insolation. I made a follow-up post to clarify this. I think we’re on the same page, though (IMO) it’s the nature of the wavetrain/waveguide itself that’s responsible, rather than insolation. Yeah, I think we're on the same page regarding the wavetrain. You're just bringing more expertise into it. So when was the last mid Dec to early Feb air mass that featured -18C 850s in WA? My guess is December 1998, if you're talking western WA? Our climate sure has warmed in recent decades. 2013 and 2008 were pretty darn close as well. At any rate, I don't think you can make a seasonal extrapolation of what was an uber-strong clipper system with strong northerly gradients and a quick shot of sub-510dm thicknesses. Other than slightly lower sun angles there's really no additional mitigating factors in late November compared to late December. That's a good point, I was mostly thinking of places like Seattle or the UIL sounding location. Wouldn't surprise me if places in the northern Puget Sound dipped lower than -18c in other events besides 1998/2010. I question how that map paints the mid-point of winter for the PNW. I'm very near that green area, and winter doesn't kick in "full force" until like early December. My mid point is probably around the US average mid point. When November is a very snowy month it's unusual. I can imagine maybe the upper Cascade Mountains seeing their mid point in mid December. But where people actually live it's later than this. It’s based on the average temperature curve (1981-2010 climatology period) amongst well-cited stations. The midpoint isn’t necessarily the coldest point, but rather the “middle” of the coldest 3 month period in the climatology. I don't think a month's difference in sun angles and deeper cold availability can be dismissed so easily. History tells us that the second half of December has the capability for significantly colder weather than late November, and yes that has included setups pretty similar to Nov 2010. But I really don't think it's a black and white answer anyhow. Every pattern has its own unique aspects, and I don't think any of us can say with certainty how exactly a Nov 2010 pattern would play out a month later. Dec 1998 did produce easily colder temps overall than Nov 2010. Yeah, the map would definitely look a bit different over a longer period. Obviously the buttload of Nov/Dec events in the 1981-2010 period relative to January ones was a major factor that exaggerates the early winter peak signal for the West. I know some people are convinced that is the permanent new normal, but I think it's more cyclical. I believe you, but I’d argue that winter has always peaked earlier in the West than the East. It makes dynamic sense when you consider the evolution of the temperature gradient/thermal wind forcing on wave dynamics. Maybe the difference has been exaggerated lately. But there’s a reason for it, and it’s not random chance (IMO). Yes, that's why I said exaggerated. It's a real phenomenon for sure. Obviously there's better odds of colder weather a month from now, but we're talking about what was an extremely cold air mass with extremely favorable low level support in the Puget Sound area and snow cover. Chances are if it happens a month later it plays out very similarly. Assuming "deeper cold" would suddenly be available is conjecture. The best comparison is perhaps the second event of December 1990. It had a clipper-esque quality with slightly colder upper levels, hence slightly colder weather, followed by a pretty quick moderation due to the lack of significant offshore flow. PDX's coldest high was 8 degrees colder with that than 2010. I thought we were talking about Washington? History tells us time and time again the north/south gradient with November events is typically pretty sharp. Couple that with the fact 12-28-90 was just a bit more potent and there you go. The Nov. 2010 pattern was also pretty similar to Dec. 1964. That one fortuitously tapped into a huge reserve of cold air in AK, where a major cold wave in the -60 to -70 range was underway in the interior. Which, in and of itself is extremely rare prior to mid-December. Yeah, Dec 1964 was one of the examples I was thinking of. Even for WA, 12-28-1990 was quite a bit more impressive in spots. Bellingham had a high of 12 on that afternoon versus 24 with the 2010 airmass. We are only a couple of days from when November 1985 went full on crazy. Where I was living I ended up with 11 consecutive days with max temps of freezing or lower. I would guess that would even be rare for locations in the NE this early in the season. Nov 2010 was a fantastic event. A nice 6 inch snowstrom which fell on brisk north winds with crashing temperatures. For the last half of the storm temps were in the low 20s. Afterward temperatures dropped below 10 well before midnight on the following night, but were kept from going below 8 by cloud cover. I think I could have achieved lower single digits if had stayed clear. Actually a colder airmass than anything that hit in November 1985. Yeah, basically. When that type of pattern has occurred in Dec/Jan, it has usually produced colder temps than most the region saw in Nov 2010. There tends to be greater cold air availability later in the season, so I think that makes sense. Speaking of 12/64, there is a sign showing the high water mark from the December 1964 flood on the Rogue River trail near Graves Creek. 55 feet above normal summer levels. Can’t even imagine that much water going through there. That's awesome. I love seeing old flood marks. My favorite is still the high water mark at Champoeg from 1861. Best recent comparison is probably January 17-19, 2012.